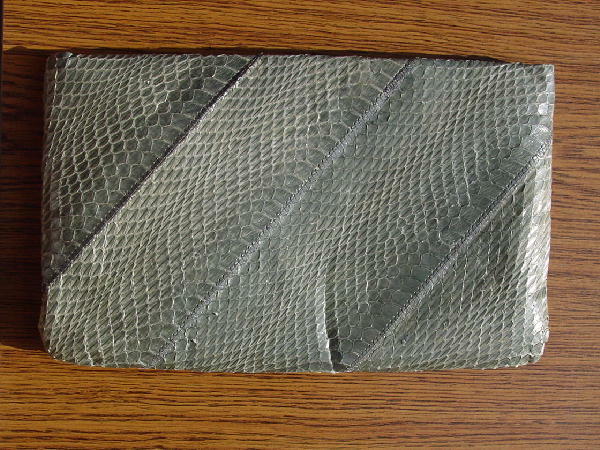 This vintage gray snakeskin purse has a top side to side zipper and a thin gray 44" shoulder strap that can be tucked in so you can carry it as a clutch. We think it looks better as a clutch. It has a side hinge closure. It has a soft black lining with an interior zipper (fabric-lined) pocket. There is a black T on the inside gray rim. Someone put the T inside for a location photo shoot in Tucson, Arizona. It's from a Hollywood stylist's collection.